Froilan Canlas made it to the semifinals of Tawag Ng Tanghalan on It’s Showtime, Saturday, December 3, 2016. 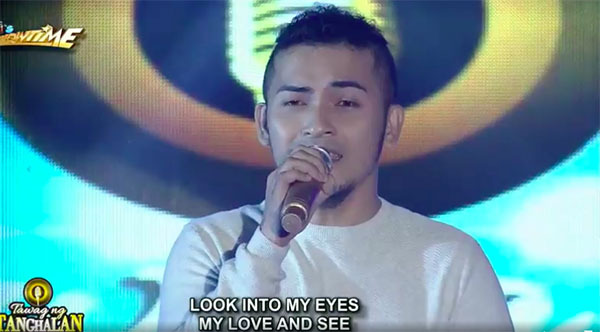 Froilan Canlas successfully defended his title on Tawag Ng Tanghalan on Saturday. He is now part of the Tawag ng Tanghalan Quarter 4 semifinalists. At the end of the sing-off, the judges gave Canlas a total average score of 95.2 percent while Michael Romero received 91.6 percent. Froilan Canlas will return on Monday to defend his title. Watch his performance on this video link. What can you say about Froilan Canlas? Share your comments on the discussion box below.